In his address last year, President Trump emphasized his "America first" approach on issues such as immigration and trade. We assess what the President lists as his achievements in this year's speech, as well as his plans for the future. We also hear responses from leaders of the N.H. Young Republicans and Young Democrats. Listen to our conversation on the 2019 State of the Union. Chris Galdieri - Associate Professor of Political Science at St. Anselm College. Andy Smith - Associate professor of practice in political science at UNH and director of the UNH Survey Center. Ross Berry - Treasurer for the N.H. Young Republicans. A former GOP senator’s response to last year’s speech. What to watch for in tonight's speech. According to the NY Times: Where Trump did and did not make progress on promises made during his last SOTU. 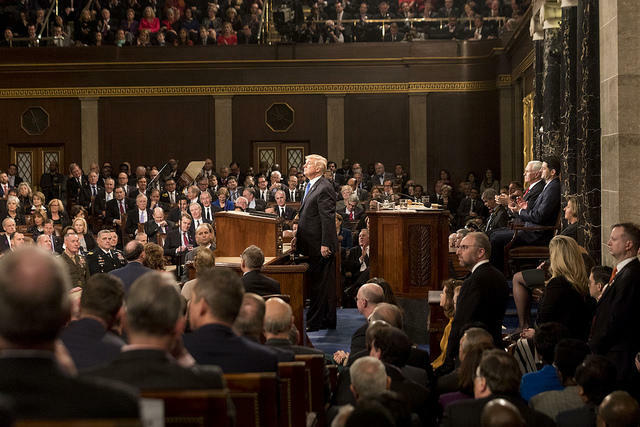 Columnist Jonah Goldberg writes that these SOTU speeches rarely move public opinion, that President Trump is likely to focus on recent abortion controversies in New York and Virginia to appeal to conservatives, and that Democrats should be careful about exhibiting any rudeness that could backfire. Dueling perspectives: E.J. Dionne and Conrad Black. The Democratic response: Stacey Abrams. Nearly every president has referred to the "state of our union" as "strong," but, as this piece reveals, there have been some interesting variations over the years.